When U.S. Army Reserve Lt. Col. Alexzandria Kelly left on active duty to Africa last year, she expected her 1972 AMC Gremlin to be safe. The Servicemembers Civil Relief Act offers civil protections to servicemembers, and one of those protections is a requirement for a court order before a lien can be enforced on servicemember-owned property. 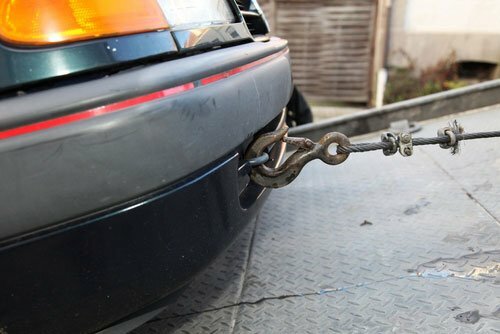 Without going through the proper channels, it is illegal to repossess or tow a vehicle owned by a servicemember. For this reason, Kelly was “in utter shock” that her car, which carried a proper license plate, vehicle registration and neighborhood association resident parking sticker, had been towed and sold for scrap when she returned from duty, according to The Sun Sentinel. While she was deployed on the Somali peninsula as a military police officer, the tires of her Gremlin had slowly deflated. On March 27, parking monitors for Kelly’s homeowners association took notice, called West Way Towing and had the vehicle hauled off. By the time Kelly returned home in August, West Way had sold the car as junk for $525. Kelly is seeking unspecified damages for “mental pain and shock, suffering, aggravation, humiliation and embarrassment together with the loss of the Gremlin,” said her lawsuit as cited by the news source. In part, this is because of the emotional value of the car, a classic model passed down to her by her late father. The owner of West Way Towing, Craig Goldstein, told the news source that he feels terrible about the mishap, and explained that he called Kelly’s attorney and offered to turn over the $525 from the vehicle’s sale. This offer was declined – Kelly wants a jury trial and appears to have a good chance of success. In cases related to the Servicemembers Civil Relief Act, however, this defense isn’t good enough. Landlords and business owners who take the law into their own hands by seizing property, evicting tenants, or selling people’s property without court approval can face very serious penalties if the debtor happens to be on active military duty. In fact, the Servicemembers Civil Relief Act even protects servicemembers for a period of time after active duty for certain types of debts. It is easy to determine whether a person has the protections of the SCRA. On-line tools such as those offered by the Servicemembers Civil Relief Act Centralized Verification Service are available to check individual or even batches of debtors. West Way Towing could have avoided its problems if it had followed simple procedures. First, by using SCRACVS it would have become clear that Kelly had civil protections against towing. If Kelly had been unresponsive or refused to move the vehicle, West Way could have then obtained a a military status affidavit and proceeded to court. In court, a judge would have begun by applying a mandatory 90 day stay of proceedings. After this point, the court would then either apply a further stay of proceedings, found an equitable solution if necessitated by Kelly’s service or allowed West Way Towing to proceed with the court’s blessing. As it stands, West Way may face serious penalties if found guilty of violating the SCRA. The penalties may be serious fines or even imprisonment for up to one year. While civil remedies can usually be reached, judges have been known to give jail time for violations of this important law in some circumstances. This case should serve to highlight how seriously legal professionals, legislators and the public should take the protections afforded to active duty servicemembers under the SCRA. Failure to comply with this law often has very real consequences. Thankfully, organizations like the Servicemembers Civil Relief Act Centralized Verification Service make compliance simple and affordable.